[GNU/]LinuxFest Northwest is the longest running, largest open source conference in the Pacific Northwest. Home to over 80 sessions and 50 exhibitions over two days. Speakers from all areas of tech, and talks covering the full gamut of experience, from newbie to guru will be there. Come for the code, stay for the people! Northwest has awesome attendees and electrifying parties. Check out the robotics club, the automated home brewing system running on GNU/Linux, or the game room for extra conference fun. The 2019 event will be held at Bellingham Technical College in Bellingham, WA from April 26 - 28, 2019. Are you attending? If so stop by our booth and say hi! Join us @ Libre Planet 2019: Trailblazing Free Software. LibrePlanet is an annual conference hosted by the Free Software Foundation for people who care about their digital freedoms, bringing together software developers, policy experts, activists, and computer users to learn skills, share accomplishments, and address challenges facing the free software movement. LibrePlanet 2019 will feature programming for a wide range of ages and experience levels. We hope to see you at LibrePlanet 2019, March 23-24th in Cambridge, MA. Register now to join us at MIT Cambridge, Massachusetts for the next LibrePlanet! Join us at SCALE! 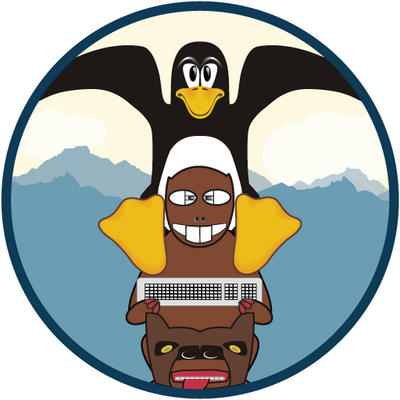 SCaLE 17x – the 17th annual Southern California Linux Expo – will take place on March. 7-10, 2019, at the Pasadena Convention Center. SCaLE 17x expects to host 150 exhibitors this year, along with nearly 130 sessions, tutorials and special events. "This will be the very first annual International Copyleft Conference. Participants from throughout the copyleft world — developers, strategists, enforcement organizations, scholars and critics — will be welcomed for an in-depth, high bandwidth, and expert-level discussion about the day-to-day details of using copyleft licensing, obstacles facing copyleft and the future of copyleft as a strategy to advance and defend software freedom for users and developers around the world." Representatives from ThinkPenguin and LibreCMC's lead developer will be in attendance and speaking so come check out the event if your in Europe! 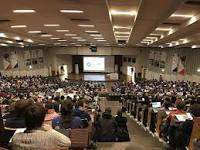 FOSDEM is possibly the largest community organized conference for free and open source software. In Brussels the first weekend in February, FOSDEM brings thousands of free software contributors and enthusiasts together for an intense two days of talks, stands and socializing. 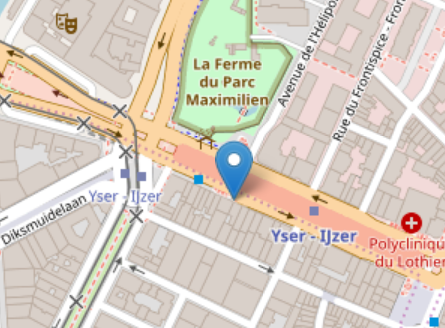 FOSDEM celebrates it's 20th year in 2019. Representatives from ThinkPenguin will be in attendance and participating throughout the weekend. If you're going to be attending, we hope you'll join us. All Things Open 2018: We're going. Are you? Join us in Raleigh, NC and The Research Triangle, the epicenter of innovation, technology and free software in the south east October 21-23, 2018. We will be showing off our laptops, peripherals, and other accessories and talking about exciting EOMA68 developers, an exciting new EOMA68 router project, and more. Robert Call will also be giving a talk on libreCMC, a 100% free embedded software distribution that we sponsor and utilize on our RYF'd routers (and runs on other types of devices from other manufacturers too!). For more information and to register check out the All Things Open web site. DEF CON 26: August 9-12, 2018 @ Caesars Palace & Flamingo! Are you in the Las Vegas area? Planning to attend DEFCON? We'll be vending at the world's longest running and largest underground hacking conference. If you ever wanted to check us out in person we'll be in attendance at this years event. It's a great opportunity to do a meet and greet and see what we're really all about. Plus check out some of the laptops, desktops, and other great items in our catalog. 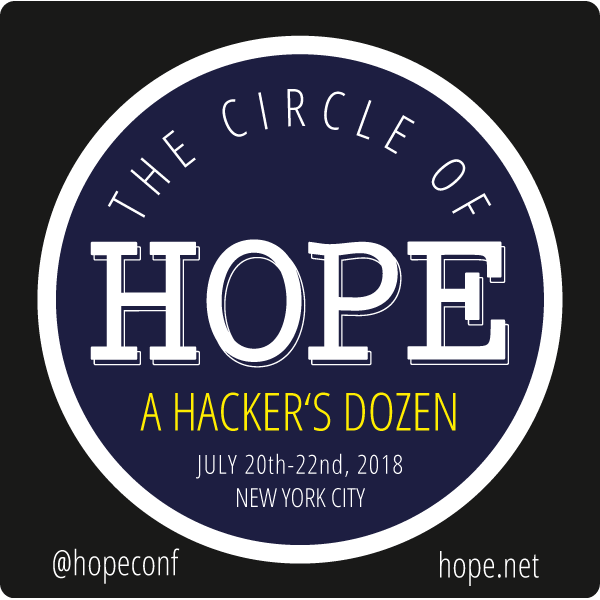 HOPE 12 will take place on July 20, 21, and 22nd, 2018 at Hotel Pennsylvania in New York City. H.O.P.E. stands for Hackers On Planet Earth, one of the most creative and diverse hacker events in the world. It's been happening since 1994. Join us for three full days and nights of activities, including more of the provocative and enlightening speakers that the HOPE conferences are known for. Featured speakers have included Edward Snowden, Julian Assange, Kevin Mitnick, Richard Stallman, Steve Wozniak, and William Binney, amongst others. This years keynote will be Cory Doctorow. Come check out our product showcase which will be on display at our booth! You can also ask us about the status of the EOMA68 modular computing standard and the first truly libre desktop and laptop housing (shipping soon) based around the Libre Tea Computer Card. For those that aren't aware of the EOMA68 project it is a modular computing standard that involves a card (the first of which is the Libre Tea Computer Card) and a housing (be it a desktop, laptop, router, or something else) where everything including the keyboard controller, bootloader, and CPU don't require any proprietary bits. You can also check out lots of other cool hardware including some of our older boring and backdoor'd intel based laptops if you so like. We've got lots of great news this week. From HOPE coming up to a new event we'll be attending: Def Con! We'll see you there. But we also released our very first podcast. We'll be talking tech, freedom, and everything libre! From interviews with the leading experts in the GNU/Linux world such as Rubén Rodríguez a.k.a. quidam to Eric Schultz on issues such as the FCC's attack on free software. We'll also be squeezing in the latest in tech with hardware demonstrations and general tech news. For this week's episode, we talked with Patrick Binder, lead project coordinator of the Manchester New Hampshire MeshNet exploratory group both about Porcfest's first mesh network and what he was putting together along with others in Manchester New Hampshire. 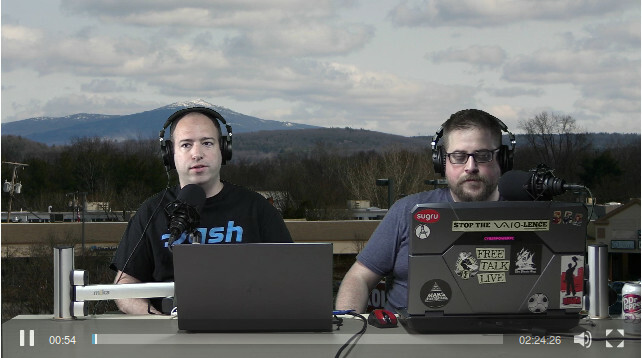 Other topics included the end of the road for Ross Ulbrick's appeals, supreme court rules cops need warrants to secure cell phone location data, and the new release of Linux Mint 19 (and the difference between free and non-free software). Surpreme Court Rules in South Dakota V. Wayfair and What That May Mean to You! An unexpected notoriously bad Supreme Court ruling has come down in a case regarding the collection of sales taxes. The Supreme Court has decided that it's more important to protect large brick and mortar retail businesses than it is to protect smaller online operators. With this ruling businesses that do not have operations in other states will have to do the impossible task of collecting and distributing sales taxes to more than 12,000 different taxing authorities. They have effectively undermined small business by placing an undue and unique burden on them. As a result of this ruling we will start collecting a small 'administrative fee' that will be determined based around a states average general purpose sales tax rate and small collection fee to offset any liabilities this ruling may ultimately impose on us and cover any sales taxes that may eventually have to be distributed for all states that currently impose a sales tax once states or federal government have figured out how that will work. There is federal legislation that is being proposed to resolve this impossible situation, but until it does we will have to collect fees to offset liability for those having goods shipped to them in these states thus offsetting some level of risk. This ruling does ignore reality in that not even the largest companies can accurately or correctly figure out the taxes owed for every address as the jurisdictional boundary lines do not match zip code data. And despite what some have erroneously argued there is no workable means of determining what taxing bodies need be paid let alone what taxes apply for any given delivery address or product nationally. The same product in many states may have more than one tax rate depending on how the product is used/installed/advertised/etc- or even vary depending on what day it is sold ("sales tax holidays" is what they call them in some states, but what products are tax free depends on the state and it could be illegal to collect a tax not owed). It would also be cost prohibitive to mail a $2 check for $2.80 in taxes to some small tax jurisdiction where you have only had one customer buy anything ever. Something that could technically be required by this ruling. This however also depends on lots of other factors and many states require licensing and other things prior to being able to pay the state or local taxing authority the sales taxes owed. Which also can be an impossible task for an out of state retailer when a state requires a physical local address to comply and/or other licensing. It also ignores the fact even large retailers have already not been accurately collecting sales taxes in many states where they have brick and mortar retail stores due to the complications in tax collection law. To be clear it is easier for a brick and mortar business to collect sales tax because they don't have to do it based on the destination address of a customer. They do it based on the stores own physical address so they at most have 2-3 taxing authorities to deal with and whatever other tax laws exist that apply to a given store. This failure to properly account and distribute is happening even within states with simpler sales tax collection rules-like New Jersey. For instance I saw Staples which is an international office supply store with operations in most if not all states fail for years to correctly collect and account for sales taxes on computer repair services after the law was changed in New Jersey 10+ years ago. Some repair services did correctly get taxed while others did not. Whether or not it was properly collected was dependent on the SKU an employee used to charge a customer for a given repair. I would presume newer SKUs were being correctly accounted for tax wise while older active ones were not. Fortunately there are still options for those who think these taxes are unfair. New Hampshire, Delaware, Montana, and Oregon do not impose any general purpose sales taxes and there are even multiple popular migration movements to states like New Hampshire over these and other related freedom issues. For instance the Free State Project advocates for a society in which governments have no right to utilize violence against peaceful people even for the purpose of tax collection. It's like the expression "the end doesn't justify the means". The objectives may be worthwhile, but the immoral actions to get there can never be justified. One of the justifications given for this ruling was that the loss of revenue from online retailers is unfair to the states with higher sales taxes. This logic completely ignored the fact states have the power to lower or eliminate sales taxes to attract business and tax revenue. Four states have no sales taxes at all, a fifth has no statewide sales tax, and a sixth has only a very low state sales tax. 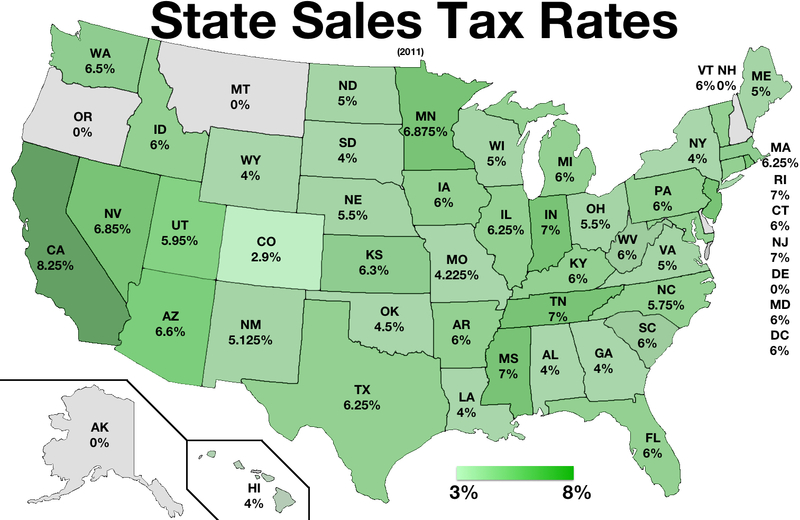 Keep in mind that while there are no or low sales taxes in these states this does not mean the states collect no taxes. As more businesses operate here as a result of lower operation and tax compliance costs more taxes are received from other revenue sources such as property taxes. Some states like New Hampshire don't have an income tax either and the overall tax burden is comparatively low due to smarter tax policies.